Splatoon is a mess. An inky, colour filled heap of fun type of mess! 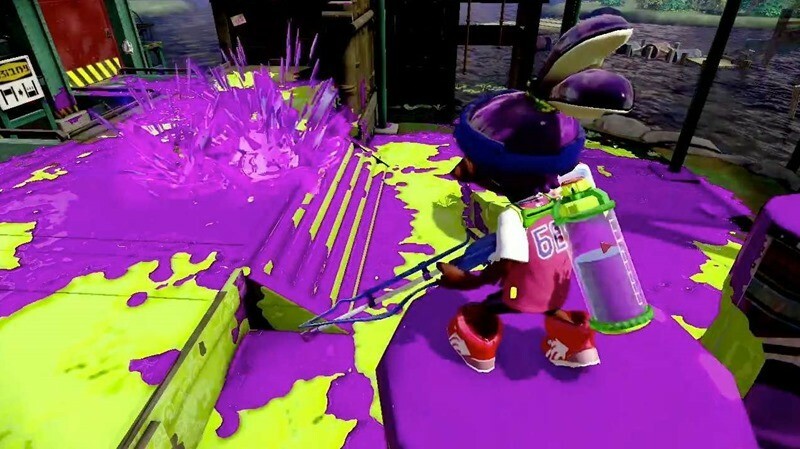 It’s quickly racing towards launch later next month, and Nintendo is slowly starting to let some more facts about their competitive shooter trickle out from the cracks. Like a good look at the one weapon that caught many eyes in the last trailer. That happens to be the Squeaklean Alpha, which Nintendo detailed a little more via Twitter yesterday. Unlike the weapons we’ve seen already, the Squeaklean acts as the Sniper Rifle for online play, dealing incredible damage at great distance but with a very slow firing rate. In fact, it looks like every shot needs to be charged up, due to the gun’s reduced ink compression tank (it’s a real thing, I promise). What follows is pure gooey gore though. Your enemies will exploded in a liquid heap of paint glory, cementing the kill if you manage to hit your target. I’m especially interested to see how some maps cater for this kind of weapon – since the ones I’ve played so far all seem to be far too quick for charge attacks. Still, people mange to use snipers effectively in Call of Duty, so it’s not a massive stretch of the imagination. As part of the hype machine Nintendo is kicking into gear for their squid-based shooter, the publisher decided to educate us on the aquatic critters we’ll be swimming around in very soon. So here’s a top ten “I bet you didn’t know that was actually an octopus” list for your reading pleasure. The giant squid have eyeballs that are the same size as a standard basketball – a helpful defense mechanism in the water that allows them to spot their surroundings more easily. Even though 300 species of squid have been identified and classified, it is believed there are at least 200 more that still need to be evaluated. Now that’s a lot of squid! Some species of squid have been found to live more than 13,000 feet deep in the water – that’s about 43 football fields in length. Tastes great when fried – with lemon butter sauce. I obviously decided to add number 11 after Nintendo so cruelly omitted it. Splatoon is out on May 29th for the Wii U. Next article CELEBRITY DEATHMATCH is making yet another return to the ring!